Horses Helping Humans™ Effective Communications Workshop. Designed for Corporate Team Building & Personal Development. Internationally recognised and award winning; Horses Helping Human’s™ tactfully combines: personality profiling, body language analysis/ techniques and horsemanship into a ground-breaking and results driven communication workshop. Its psychological base and scientific backing provides proven results time and time again. Sue Spence of Horses Helping Humans™ Australia founded this program in 2006. She was delivering the programme internationally and due to the high number of inquiries, Sue started licensing to other facilitators in 2016. Kimberley McIntyre was the first to start facilitating the corporate and personal development programme here in New Zealand, based at Makoura Lodge. Kimberley's passion for helping others and for horses enables her to represent Horses Helping Humans™ at the highest level. Kimberley facilitates the communications/ teambuilding workshop at her property at Makoura Lodge. Sue Spence's book (founder) of how the programme came about. Kimberley's journey with HHH™ started from reading this book, she then contacted Sue to become NZ's first corporate licensee. When we stand correctly, the horse (people) will listen. Due to the success of Horses Helping Humans™ it has attracted the attention of media & most currently the attention of Virgin airlines where it features on flight. Kimberley teaching about focus and boundaries. 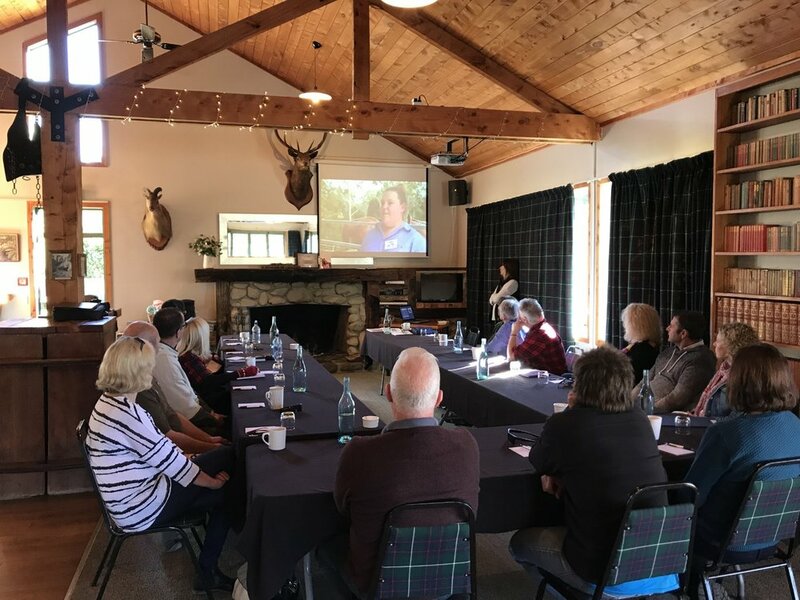 Horses Helping Humans™ workshops are presented into companies internationally and exclusivly in NZ at Makoura Lodge. Teaching the confident & assertive stance. Teaching how to open up the body in order to be heard. Understand yourself and others better Learn how your team or family members tick through Horses Helping Humans unique personality profiling programme. This is desirable for sound communication, improved relationships, effective management and increased productivity. Body language awareness. Look confident, be assertive but calm (leadership status). Increased self-esteem. Be heard. Learn when you look confrontational and how to reduce flight or fight and how to recognise it in others, so you can then respond rather than react. Stress reduction techniques. Better decision making. Diffuse before you discuss. Become more relaxed. Increase in emotional health. Create happier environments & people. Activate your parasympathetic nervous system. Boundaries. Learn to say no & what it looks like. Manage workload. Learn to ask not tell; increases thought processes. Emotional regulation. Learn that calm assertiveness = quicker response time. Learn how powerful you can be with just a breath. Increase focus & motivation, reduce apathy. Energy awareness and direction. Investment: $2000 for up to 10 participants. Over 10, additional participants are $150pp. Maximum of 12. Includes workbook. As horses rely 100% on body language and energy levels to communicate they can pick up the slightest cues in our body language. It is researched that humans communicate over 60% in body language, learning the techniques we teach with the help of horses enables us to open the doors of communication. As horses are a prey animal their life depends on reading situations/ people very carefully; so their reaction to us is essentially a mirror of our actions and emotions. Horses make great teachers. They provide us with immediate, honest and non-judgment feedback. By learning to slow a horse just by breathing out you will realise the power of calm assertiveness. Please note- No previous horse experience is required. Interaction with the horses is done on the ground (no riding). 10.30am- Programme introduction, learn what personality type you are (based on the four temperaments but with a modern and humorous twist), learn what your body language is communicating to others and yourself. 12.30pm- Exercises with the horses, analysis and adjustment of your body language. See how the horses responds to your body language; instruction and energy. 3pm- Debrief over afternoon tea. Completion of the workshop. Continue Conference (for overnight conference retreats) or depart if day workshop only.